Pennsylvania State Cookie (proposed) | Chocolate Chip, Sugar Cookie, or Oatmeal Chocolate Chip? Homemade chocolate chip cookies; photo by Liza Lagman Sperl on Flickr (noncommercial use permitted with attribution / no derivative works). Chocolate Chip, Sugar Cookie, or Oatmeal Chocolate Chip? In 1996 a group of 4th-grade students at Caln Elementary School in Coatesville, PA, initiated efforts to get sponsorship for a resolution designating the chocolate chip cookie as the official state cookie of Pennsylvania. However, the legislation to adopt a state cookie has been held up for several years as lawmakers struggle between the chocolate chip, Nazareth sugar cookie (House Bill 219), and the oatmeal chocolate chip cookie (House Bill 2479). 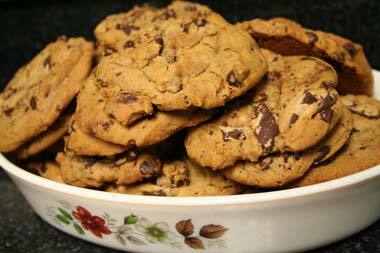 The chocolate chip cookie is an official symbol of Massachusetts (home of the famous Tollhouse chocolate chip cookie). The only other state that recognizes an official cookie symbol is New Mexico (their state cookie is biscochito, an anise-flavored shortbread), but many states have adopted other sweet treats as official state symbols: cakes, pies, muffins, pastry, and ethnic specialties (all state foods). Senate Bill 320 (introduced to designate the chocolate chip cookie during the 2003-2004 legislative session) points out that snack food production is a key element of Pennsylvania's number one industry (agriculture) and that naming an official cookie of the Commonwealth would recognize the steadfast and loyal devotion of the citizens of Pennsylvania to the chocolate chip cookie. This wording appears to be modeled after the legislation adopting the great Dane as the state dog of Pennsylvania ("recognizing the steadfast service and loyal devotion of all dogs in Pennsylvania").